According to a new market research report \“Mass Spectrometry Market by Platform (Hybrid mass spectrometry (Triple Quadrupole, QTOF & FTMS), Single mass spectrometry (Quadrupole, TOF & Ion Trap)), Application (Pharmaceuticals, Biotechnology, Environmental testing) – Global Forecast to 2022\“, published by MarketsandMarkets?, the market is expected to reach USD 5.27 Billion by 2022 from an estimated USD 3.68 Billion in 2017, at a CAGR of 7.4%. Sciex under Danaher Corporation (US) dominated the mass spectrometry market in 2016. The company provides a wide range of mass spectrometry technologies, accessories, and software in the mass spectrometry market. These products find application in a range of industries including pharmaceuticals, environmental agencies, food & beverage, petroleum industry, and research laboratories. 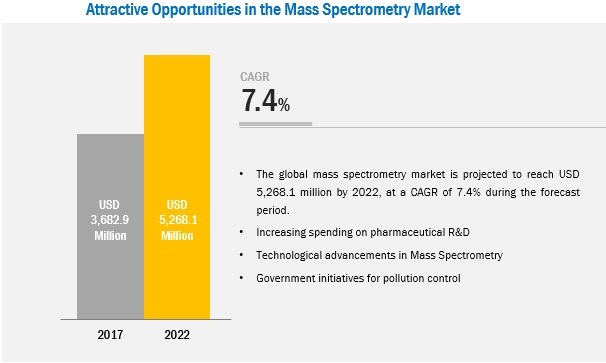 To maintain its leading position and increase its customer base in the mass spectrometry market, the company mainly focuses on expanding its market presence by enhancing its product development capabilities and product launches & enhancements. For instance, in 2017, the company launched the Topaz LC-MS/MS System and the software called BioPharmaView 1.5 Software, an addition to its existing portfolio. The company has a strong R&D and manufacturing infrastructure, with its presence in Europe, North and South America, Asia, Africa, the Middle East and the Rest of the World. Factors such as availability of funds for research, growing cosmetics industry in Germany, growing food safety concerns and increased investments for pharmaceuticals in the UK, favorable scenario of biotechnology and pharmaceutical industry in Italy, company\-\-s expansion in France and strong food and beverage industry in Spain are driving factors of the European Mass Spectrometry Market.